Dust can�t escape the long arm of the Vac N Blo! Upgrade your Metro Vac N Blo vacuum with this optional 3 ft. hose! The hose features durable, flexible construction. The hose extends the reach of your Metro Vac N Blo when combined with the vacuum�s included 3 ft. hose. Reach under car seats, into trunks, and into all the nooks and crannies of your vehicle with Vac N Blo 3 ft. hose attachment. The Metro Vac N Blo 3 ft. Hose works with the VAC N GO 500 Hand Vac and the Vac N Blo Portable Vacuum. Multiple hoses can be connected. 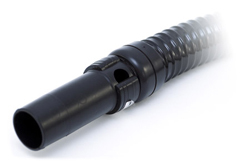 This hose attaches to your vacuum�s existing hose or to the 6 ft extension hose. Every hose has a power control at one end to control the flow of air. Extend your reach with the Vac N Blo 3 Ft. Hose!